Situated high above the Fowey Estuary, on the edge of Bodinnick village, with spectacular views across the hills and valleys of Southern Cornwall. Divided into two areas; The first offers miles of stunning views across the Cornish hills, the second is screened, lawned and sheltered. Choose your own pitch from those available on arrival. With modern. 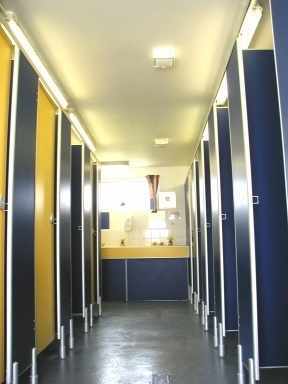 heated and immaculately clean toilets and shower blocks, hairdryers and shaving points, a reception with shop and off-licence, disabled facilities, laundry room, numerous drinking water points and electric hookup points. The picturesque village of Bodinnick is a short walk away with the famous Old Ferry Inn, Daphne du Maurier's House and ferries to Fowey. 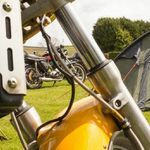 Venture out to explore rocky bays and quaint villages, the Eden Project (beat the queues - advance tickets available from reception), National Maritime Museum, Polperro and Looe and for the more energetic a wide range of water sports are available. 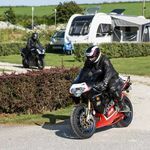 Join owner Marcus (a Biker himself) and his team at this great site. A previous guest said "Great site very very clean. Toilet block spotless. Owner & Staff 100%". 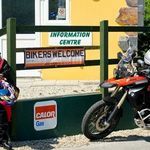 Availability through the on-line booking system is in real-time and updated so you can see the availability with ease. 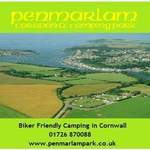 Biker Friendly Campsites, Camping, England, Cornwall, Fowey, Padstow, the town of Padstow with its towering cliffs, wide sandy beaches, hidden coves and beautiful countryside and within easy distance of the beautiful town of Wadebridge, Rame Peninsula, overlooking Plymouth Sound, the villages of Kingsand and Cawsand with beaches, pubs and shops, catch the ferry to Plymouth to visit the Barbican, Aquarium and Plymouth Hoe., the small village of St Merryn and visit (and leave) Bodmin Jail - the last County Jail in Cornwall!